7/20 Cup of Coffee: Pawtucket won a close one while Portland blew away their opposition. Salem lost big, and Greenville followed suit. Lowell lost a heartbreaker and the GCL club exploded for 10 runs. Pawtucket downed the Buffalo Bisons (TOR), 3-1. Brandon Workman pitched well, throwing five innings of three-hit baseball, walking two and striking out six. Ryan Verdugo made his PawSox debut with 1 2/3 innings of scoreless work and Miguel Celestino closed out the game with a perfect ninth. The rehabbing Will Middlebrooks went 2 for 4 with a solo shot in the fifth. Carlos Rivero drove the offense, also going 2 for 4 with a home run, two runs scored and two walks. Both Andres Torres and Garin Cecchini went 1 for 4 with a double. The Sea Dogs blew out the New Hampshire Fisher Cats (TOR), 10-3. 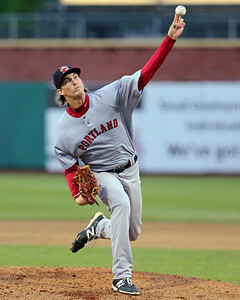 Henry Owens (pictured, above) picked up his 13th win of the season for his 6 1/3 inning effort. Owens allowed two runs on nine hits and a walk while striking out six. Noe Ramirez closed out the game with 2 2/3 innings of two-hit, one-run baseball. Both Ryan Dent and Shannon Wilkerson had three hits including a double as the Sea Dogs Pounded out 13 hits in the game. Blake Swihart went 2 for 5 with a solo home run and Peter Hissey also collected two hits in the contest. Salem fell to the Potomac Nationals (WAS), 6-1. Simon Mercedes took the loss, allowing three runs on eight hits and one walk while striking out six across five innings. William Cuevas had a similar line, surrendering the final three runs on seven hits and one walk in the final four innings. Carlos Asuaje collected his first Carolina league hit, going 1 for 4 on the night. Jantzen Witte definitely led the charge for Salem, going 3 for 4 with two doubles and a triple, though this clearly wasn't enough to put Salem over the top. Greenville's first game against the Asheville Tourists (COL), a make-up of Friday night's game, was postponed due to inclement weather. In their regularly scheduled meet-up, Greenville failed to hold on to an early lead as Asheville won, 6-3. Trey Ball (pictured, right) put together one of his best performances yet, spinning five innings of two-hit baseball, walking none and striking out four. Jonathan Aro took the loss though, allowing six runs (five earned) on five hits and three walks. Aro failed to strike out a batter. The Drive pushed across all three of their runs in the first inning and were held at bay after that. The Drive also managed only five hits, all of them off the bats of different players, but they were helped out by three Asheville errors. Cole Sturgeon and Wendell Rijo both collected a hit and Rijo added a walk as well. Lowell lost in heartbreaking fashion, falling to the Auburn Doubledays (WAS), 5-4. After jumping out to an early 3-0 lead in the top half of the first, Auburn retaliated with two of their own in their half of the inning. Ty Buttrey started the game, allowing two runs (one earned) in 2 2/3 innings pitched. Buttrey allowed five hits and two walks while striking out three. Oscar Perez threw 3 1/3 clean innings in relief of Buttrey. It was James Shepherd who got roughed up though, taking the loss thanks to a three-run bottom half of the eighth inning. Lowell only managed six hits in the contest, all from different batters and only two went for extra bases. Jordan Betts went 1 for 4 with a double while Sam Travis went 1 for 4 but added two RBI to his line. Alixon Suarez collected the other double for Lowell. 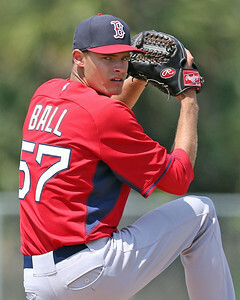 The GCL Red Sox exploded offensively to clobber the GCL Twins, 10-1. Javier Rodriguez was superb, picking up his fourth win of the season thanks to five innings of two-hit, one-(unearned)run ball. Yankory Pimentel, Jalen Williams and K.J. Trader combined to allow only one hit in the final four innings. Surprisingly, the Red Sox needed only eight hits, including one extra-base hit, a double from Derek Miller, to generate 10 runs. Rafael Devers went 2 for 5 with two runs scored, while Joseph Monge also went 2 for 5 with one run and one RBI. Each of the first seven batters crossed home plate at least once. Michael Chavis continues to struggle, he went 0 for 4 with a walk, a run and two RBI. Player of the Night: Henry Owens has set up camp here every fifth day. His 13 wins easily lead the Eastern League, with the next closest only having 10. Owens also leads the league in ERA (2.25), strikeouts (117) and WHIP (1.06). The next closest pitcher in the strikeout department has only 91, a margin of 26.